Grace Bay Beach is known as the best beach in the world, and this beautiful 2-bedroom condo is just a few steps away. Swim, sunbathe, and snorkel your days away with this West Bay Club condo as your home base, and chances are you’ll never want to go home. At the condo, 2 large bedrooms are ideal for couples traveling together or for a family, and all the basics are included - full kitchen, dining area, and living area. Everything is modern and comfortable and done in a relaxing decor. Outside is a breezy oceanfront terrace where you can take in the views or relax with a book or a cocktail. If you’re not headed to the beach, you can take advantage of some of West Bay Club’s amenities, like the pool or the fitness center. West Bay Club is one of Turks & Caico’s finest hotels. Located in Providenciales on the shores of Grace Bay, it offers a peaceful retreat with an architectural style that blends Caribbean charm with modern chic. 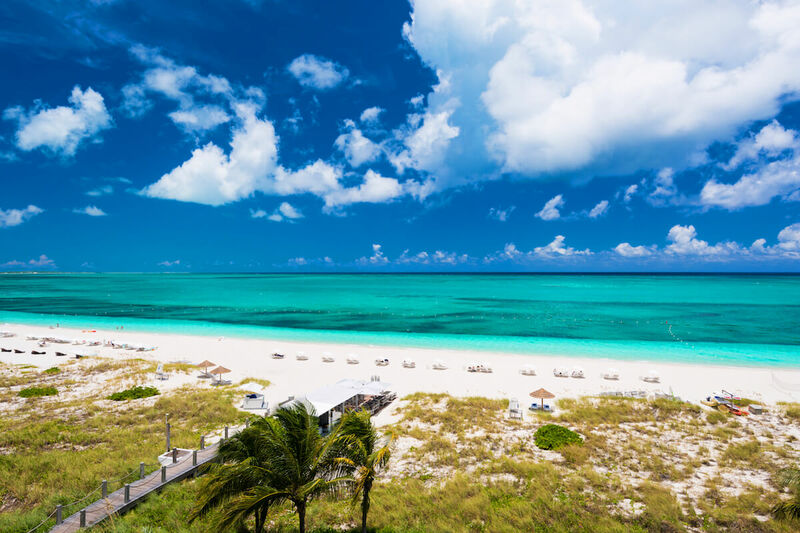 West Bay Club features nicely appointed ocean front suites and a boutique range of amenities, all placed directly on the white sands of the Turks and Caicos’ most famous attraction - Grace Bay Beach. 1,401 sq ft. Living/dining room with ocean front terrace and Kingsley Bates outdoor furnishings and full kitchen. Master bedroom with ocean view, king-size bed, and private bathroom; 2nd bedroom with courtyard view, queen or twin beds, and separate bathroom. Features include: Air-conditioning, ceiling fans, bathrobes, marble bathrooms and floors, safe, complimentary wireless internet, 46-inch flat panel TVs with cable, DVD/CD surround-sound home theatre system, iHome clock radio, state-of-the-art stainless steel appliances, granite counter tops, wine cooler, and washer/dryer. Occupancy: 4 guests. Up to 2,261 sq ft. Large living/dining room with spacious ocean front terrace and Kingsley Bates outdoor furnishings, full kitchen, and powder room. Master bedroom with ocean view, king-size bed, and en-suite bath; 2nd bedroom with courtyard view, king-size bed, private bathroom, and extra kitchenette. Features include: Air-conditioning, ceiling fans, bathrobes, floor to ceiling windows, complimentary wireless internet, 46-inch flat panel TVs with cable, DVD/CD surround-sound home theatre system, iHome clock radio, safe in both bedrooms, master bath with separate tub and shower and double sinks. State-of-the-art stainless steel appliances, marble bathrooms and floors, granite counter tops, wine cooler, washer/dryer. Occupancy: 4 guests.